I feel I ought to warn you. This is not a practical housekeeping manual. 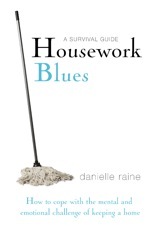 There may be the odd tip or useful gem, but the main aim of this book is not to teach you how to clean your home. My intention is to help you cope with the unique psychological challenge of being a modern female with a home to keep. This book is less ‘how to’ and more ‘why bother’. These are strategies to keep you sane. If, like me, you lack the domestic gene where housework comes naturally, or your feminist tendencies make you want to run screaming from mop and bucket, then this book is for you. It’s a collection of ideas that I’ve stumbled across, ideas that have eased the mental burden of doing what must be done within the home. My wish is that these simple suggestions will save you years of anguish and frustration. And I hope that these perspectives will liberate you to enjoy a beautiful home with both your sanity and relationships intact. through as I discovered more of my blocks. Perhaps the best thing is just how I feel about my house. All the stress is gone. Most of the time it’s really tidy, sometimes it’s not. I don’t mind. I know I’m making progress all the time.